Mexican immigration officials say activist Irineo Mujica, who has dual U.S. and Mexican citizenship, is accused of property damage and resisting arrest. A statement from the officials says that Mujica attacked immigration agents, as well as local and federal police, after he was asked for his identification as he gathered foreigners for a protest. Edgar Corzo, a representative of Mexico's National Human Rights Commission, who is in Ciudad Hidalgo, says police are accusing Mujica of slashing the tires on an immigration agency vehicle. Mujica's organization, Pueblo Sin Fronteras, or People without Borders, said he was arrested during a peaceful protest Thursday in Ciudad Hidalgo at the Mexico-Guatemala border. Mujica led a migrant caravan through Mexico to the U.S. border last spring. Mexico's foreign ministry says government officials at its southern border with Guatemala have started assisting the early arrivals from a caravan of some 3,000 Honduran migrants that has drawn sharp criticism from U.S. President Donald Trump. Most of the migrants are hoping to continue north to the U.S. border. In a statement Thursday evening, the agency says officials are explaining the migrants' options and helping those who have requested refugee status to navigate the process. Mexican officials have said the Hondurans will not be allowed to enter as a group. They say individuals will either have to show a passport and visa — something few have — or apply for refugee status. Trump has been pressuring Central American governments and more recently Mexico to stop the migrant caravan, and on Thursday he threatened to shut the U.S.-Mexico border if the migrants are not stopped. Video circulating on social media appears to show Mexican federal police and immigration agents detaining migrant activist Irineo Mujica, who led a migrant caravan through Mexico last spring. Mujica's group Pueblo Sin Fronteras, or People without Borders, tweets that he was detained Thursday during a peaceful march in Ciudad Hidalgo on Mexico's southern border with Guatemala. That's where some 3,000 Honduran migrants hoping to reach the U.S. are expected to try to enter Mexico. In the short video clip, police and immigration agents are seen pushing Mujica into an immigration agency van while surrounded by a crowd of people. Mujica appears to be resisting. Mexico's immigration agency has not yet responded to a request for comment. U.S. President Donald Trump has been pressuring Central American governments and more recently Mexico to stop the migrant caravan. U.S. President Donald Trump has thanked Mexico after noticing a video showing its federal police arriving at the border crossing where some 3,000 Honduran migrants are expected to try to cross in the coming days. Trump tweeted Thursday: "Thank you Mexico, we look forward to working with you!" He included the short video of Mexican federal police disembarking in the southern town of Tapachula on Wednesday. Mexico's federal police commissioner has said the officers will support immigration agents. Mexico has said migrants will have to show a passport and visa or apply for refugee status. Otherwise they will face deportation. Trump has been pressuring Central American governments and more recently Mexico to stop the migrant caravan that has been advancing from Honduras. The migrants fleeing poverty and violence are trying to get to the United States. Earlier Thursday, Trump threatened to close the U.S.-Mexico border if Mexico didn't stop the caravan. Mexico's interior ministry says in a Thursday statement that the government will ask the Office of the High Commissioner for Refugees to support Mexican agencies attending to the migrants. Foreign Minister Luis Videgaray plans to make the formal request during a meeting Thursday with U.N. Secretary General Antonio Guterres in New York. Videgaray says that "for the Mexican government it is essential first to respect and protect the human rights and fundamental dignity of all of the migrants and to do so under a logical and humanitarian and respectful treatment." U.S. President Donald Trump threatened on Thursday to close the U.S.-Mexico border if Mexico does not stop the migrants. The migrants have begun arriving at the Guatemalan side of the Mexican border. 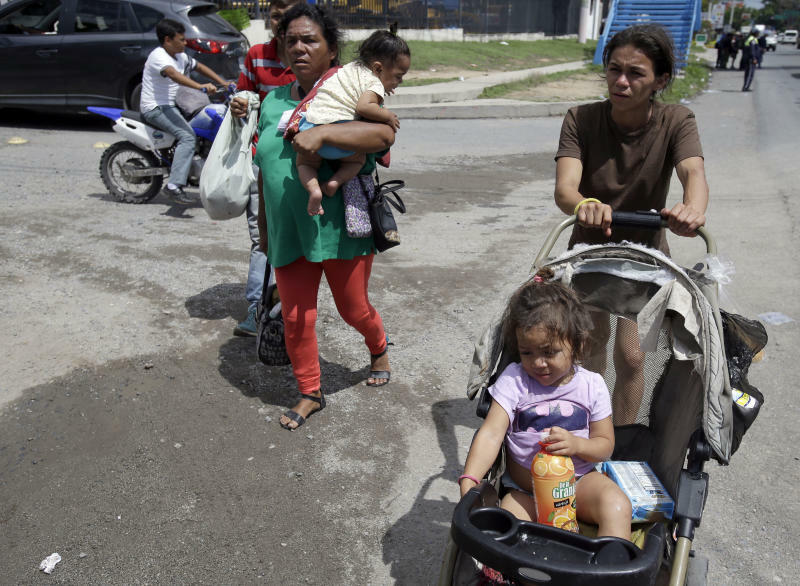 Several thousand Honduran migrants who set out in a caravan hoping to reach the United States have passed through Guatemala City and now have their sights set on the border with Mexico. Mauro Verzzeletti is a priest who runs the Casa del Migrante shelter in the Guatemalan capital. He says about 3,000 people slept there overnight and left around 4 a.m. to continue the journey. Verzzeletti adds that "more are arriving." The caravan has largely dispersed. 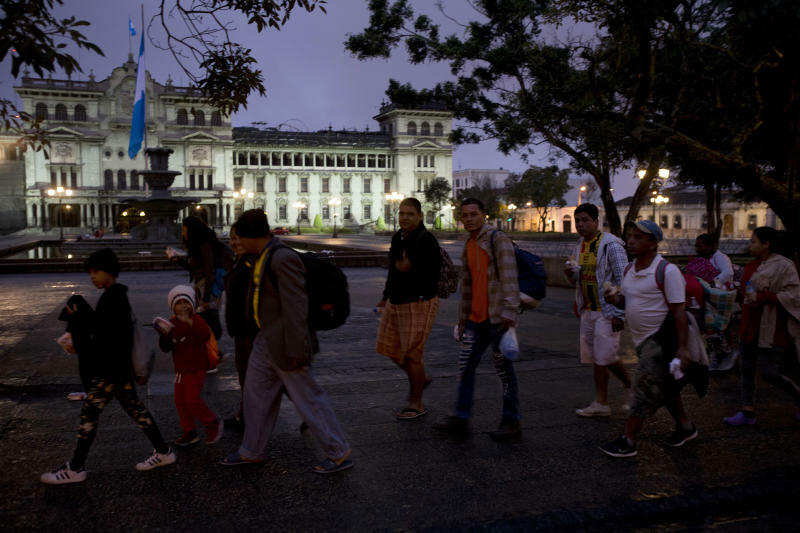 In Guatemala City on Thursday morning, different bands of people could be seen walking together in a line, some boarding buses or trying to hitch rides. U.S. President Donald Trump is lashing out over a caravan of Central American migrants trying to reach the United States, saying that if Mexico does not stop the effort, he will use the military to "CLOSE OUR SOUTHERN BORDER." 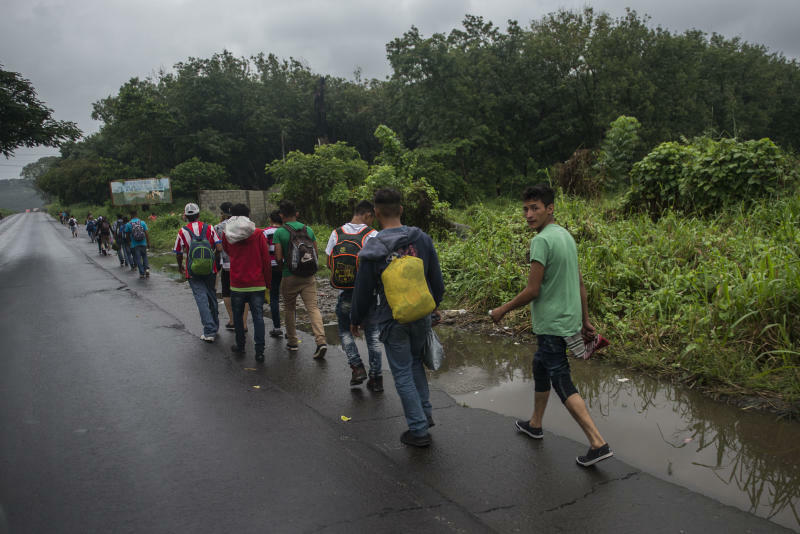 Many of the more than 2,000 Hondurans in a migrant caravan trying to wend its way to the United States are finding help from sympathetic Guatemalans even as local governments and U.S. President Donald Trump are trying to discourage them. Many left spontaneously with little more than the clothes on their backs and what they could quickly throw into backpacks. In neighboring Guatemala, they have been helped at every turn by residents who offered them food, water and rides in pickups or on flatbed of semi-trailer trucks.